Is brown the new black? 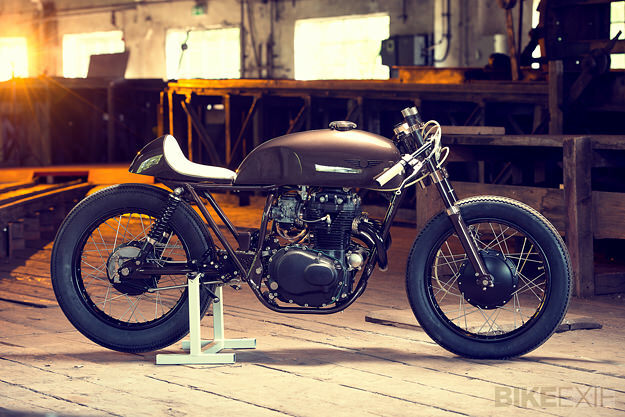 This highly-caffeinated Honda CB café racer built for a coffee company sure looks good. It’s a creative mix of CB250, CB360 and CB400 parts, and it took Christian Schwarzenlander of ExesoR Motorcycles over two years to construct. Christian is a quality control engineer from Austria, and his attention to detail shows in every aspect of the build. 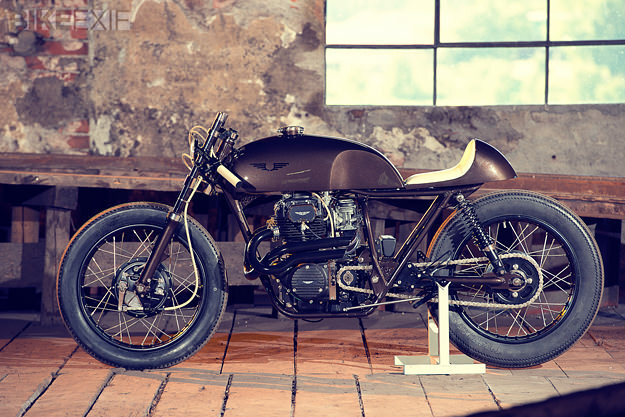 The prestigious German magazine Custombike was impressed too, and earlier this year, awarded Christian the first prize in its annual competition—the first time that a café style bike has taken the top honor, and the first Honda too. The work is meticulous. 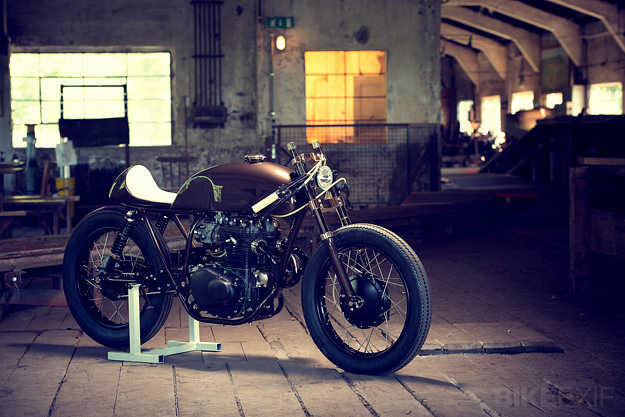 Christian strengthened the CB250 frame and slotted in a CB360 motor, bored out to 390 cc. The motor itself is blueprinted and juiced up, with a hot cam and a tweaked intake manifold. The kickstart is removed in favor of electric start, and power now runs through a race clutch. 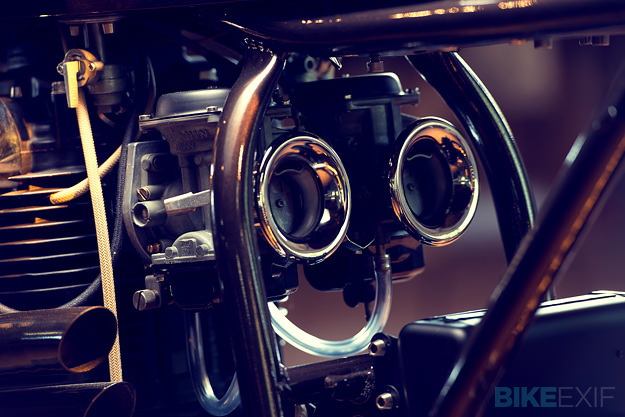 A Dyna ignition system controls the spark, and a custom-made LiFePo123 accumulator acts as a battery for starting. The suspension is pretty trick as well. Christian’s upgraded the stock CB250 forks with Wirth springs, and coated the inner tubes with DLC—diamond-like carbon—a treatment more usually found on racing forks. 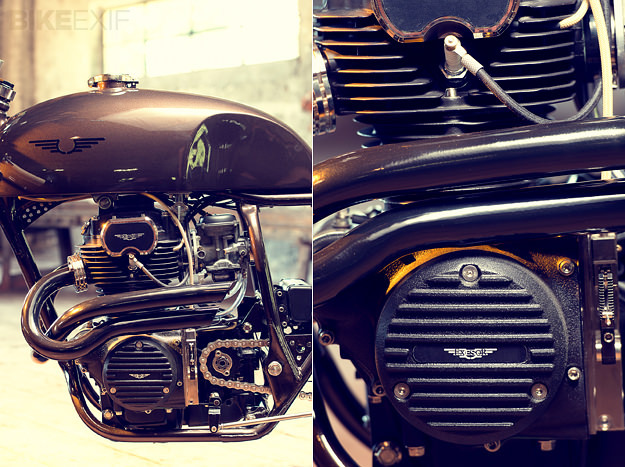 The swingarm is a CB400 item extended 7 cm, with a custom-fabricated chain tensioner, and the drum brakes have been modified with extra ventilation to keep them cool during brisk riding. The construction is impressive, but for me, it’s the warm, vintage aesthetic that takes this one to another level. Head over to the ExesoR website for more images of Christian’s work, and follow his news via Facebook.